th greet you. It is an honour for us as a community and collection of beings to communicate with you personally. We wish to share with you our love and peace to support you in your personal and collective ascension missions upon the Earth. As Tree Spirits, our energy is both linked to the sacred vibrations of the Creator and grounded deep into the earthly vibrations of Mother Earth. We reside within the physical planes and the spiritual planes which allows us to access the larger picture of what is occurring on the Earth and the within Universe of the Creator. Although a single physical tree often houses one spirit, it can house more, we are linked as if wired together, meaning that all trees are connected. This network of energy and light allows us to exist as one Tree Spirit Consciousness, as a source of active vibration and awareness, we are an energetic body of oneness even though we appear as singular. We are in constant communication through our network which is the essence of our existence upon the Earth. When you connect with a single tree, you are connecting with our entire community, consciousness, and source of all that we are and all that is the Creator. Awaken your Divine Blueprint of Perfection and ability to exist with conscious awareness of both the physical and spiritual realms. The plants, flowers and trees demonstrate the perfection codes and blueprint of the Creator. The Nature Spirits, meaning the souls embodying our nature kingdom on the Earth, wish to share their energy, love and consciousness with you to activate healing, health and vitality within your being, returning you to your original blueprint and perfection of the Creator. This is a beautiful meditation that aids deeper connection, union and appreciation of the Nature Kingdom as well as realising the similarities between you. The Nature Kingdom experience the physicality of the Earth and the energetic light of the inner planes simultaneously. The Nature Kingdom wish to support you through this activation in awakening your ability to exist with greater conscious awareness of the physical and spiritual worlds as one. They merge their energy, codes and templates with you to support you in recognising your templates of perfection, health and wellbeing within you. Allow your inner truth to emerge while deepening your connection with and understanding of nature. Blessings of love and truth, I, Master Kuthumi, bring forth to you. I am the World Teacher alongside Master Sananda, together we oversee the spiritual education and ascension of all beings at a planetary and earthly level. It is our purpose to be of service to you, to gift you information and knowledge as well as awakening transformation and enlightenment within you. We created contracts with each of you before your incarnation onto the Earth. In these contracts your soul stated the reason for your incarnation and what your soul wished to discover and awaken, we then shared how we could be of service and support your soul. We wish to make you aware of the contract, so you may realise that you can call upon us to activate wisdom within you, awaken knowingness and instigate transformation to be of service to your soul’s incarnation upon the Earth. ‘Master Kuthumi and Master Sananda, I call upon your energy, love, wisdom and presence to be with me now. Support me in opening to receive all you feel guided to share with me, let me receive with a clear mind, heart and being, so I may benefit fully from the experience. While re-establishing our connection with you and reawakening the contract of service we wish to provide to your soul allows you to access ancient wisdom, knowingness and truth within your being, there is a deeper activation taking place. Within your soul and the core of your soul, even within the core of your soul group there is stored ancient wisdom and truth. Ancient wisdom and truth are the knowledge, techniques, energies and understanding which no longer exist upon the Earth and sometimes within the Universe of the Creator. It is civilisations, their purpose and teachings which your soul and even your soul group has forgotten. This wisdom and truth can be so ancient that it holds keys of energy and even DNA stands of light which manifested during the original expressions of the Creator. While some of this wisdom and knowingness is no longer essential or needed upon the Earth and the inner planes, there are aspects which need to be rediscovered to create a wholeness and completeness in the knowledge of humanity and beings upon the inner planes. Akin to key pieces of wisdom that complete the larger picture of all that is the Creator that is awakening and downloading within your being. This ancient and much needed energy is hidden at the core of your soul, it has been long forgotten. When activated it will also reawaken a new energy surge and cycle within your being which will assist in empowering your sensitivity to and awareness of your spiritual abilities, your guides, your ascension process and the inner planes of the Creator’s Universe. When an aspect of the Creator is hidden, even if it is wisdom or conscious awareness, it creates a blockage in your energy system restricting the full flow of your power, vitality and light. While this may go unnoticed through several incarnations, generations and civilisations without causing any problems to your ascension process and the expansion of your being, there will come a point when your vibration can no longer tolerate the blockage, causing healing and a release to take place. That time is approaching. 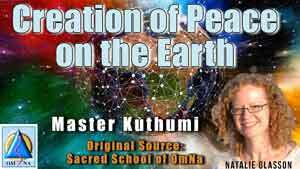 I, Master Kuthumi, alongside Master Sananda have put an energy in motion assisted and magnified by the Creator to bring the ancient wisdom and truth to the surface once more, and for the blockage to be released. We believe that many light workers are ready to experience a deep release and freedom of their energy flow within their being, resulting in ancient wisdom and truth unfolding into their conscious awareness. The energy we have put into motion will only serve and work with those who are ready and willing, it will not cause any trauma or distress of any kind. Instead it will be like a bubble bursting, illusion scattering with an overall sensation of freedom and relief in your energy flow. You will notice your energy field expanding and growing in power which will be inspiring. The energy that Master Sananda and I have put into motion will also cleanse and purify the ancient truth and wisdom awakening from your core, this means that all unneeded energy or wisdom will be dissolved eternally. Therefore, there is no need to be concerned about being distracted by unneeded energies or worrying about being confused, the wisdom awakening will be perfect to inspire and further awaken you. ‘Master Kuthumi and Master Sananda, please align me to the new movement energy transmission you are now bringing forth for the planetary level. Let me receive the energies, frequency and light, penetrating into my entire being and soul to awaken the ancient wisdom and truth held within the core of my soul. May the awakening of ancient wisdom and truth be smooth and easy liberating my being and releasing any or all blockages within my energy system and flow. I am liberated, empowered, magnified and enlightened. The purpose of this activation is to increase my energy flow, strengthen my sensitivity and connection with the Creator as well as supporting me in retrieving and remembering what I need to in order to recognise the wholeness, completeness and totality of my being as an aspect of the Creator. In love, truth and blessings, I, Archangel Michael, extend my energy to synthesise with yours. We are all one in the Universe of the Creator. We all hold the key to unlock the truth of the Creator, bringing the truth into our awareness, expression and actions. The truth is present within all souls and each soul can access the complete and whole truth of the Creator. There are no limits to the abundant and expansive nature of the Creator’s truth, therefore there are no limits to you accessing and accessing the Creator’s truth. Imagine an energy or consciousness that is far more expansive than you could ever envisage, it holds everything you wish to understand and so much more. Imagine that you have the ability to embody this energy or consciousness and understand it completely. This is the truth of the Creator. It is your divine right to accept and acknowledge the complete truth of the Creator in your current embodiment. I, Archangel Michael, wish to empower you to realise that all you seek is within you and can be accessed through your choosing. Cleansing and purifying your being supports openings within you which direct you to choosing to access new wisdom and understandings. Often it is not the holding onto certain energies or blockages that hinder your awareness of the truth of the Creator within you, instead it is your choosing to distract yourself. When you choose to see, sense and acknowledge the truth of the Creator in every moment of your reality then you create a powerful promise to yourself and an unwavering alignment with the truth of the Creator. Your promise is to realise when you are distracting yourself, if something requires to be healed, then instigate the necessary acts for healing to take place. Let yourself be focused and alert in the needs of your being, when shifts are required and when healing is essential. This will mean that you are able to remain in the space of your promise to yourself of choosing to see, sense and acknowledge the truth of the Creator. This way new openings of truth will manifest from within your being and you will more easily access the complete truth of the Creator. The Earth is a planet devoted to creation, every soul who comes to the Earth enrols in the processes of creating; learning and remembering how to create their existence and the world from the source of all that is the Creator. This means that your purpose on the Earth is to create for yourself and to support others. That which you choose you create. When you choose to see, sense and acknowledge the truth of the Creator in every moment of your reality, you are empowering yourself and your ability to create. You become a creator, you manifest and express the truth on the Earth. This is immensely powerful, as you can create infinite possibilities because the truth of the Creator is infinite. The way you choose to see, sense and acknowledge the world around you fuels the way you create your life and existence in the world. If you choose to see negativity in the world you will create more negativity. If you choose to acknowledge the presence of light, love and truth even in the deepest darkness you will create light, love and truth for yourself and your reality. What you choose to think, feel, see, sense, acknowledge, communicate and express in every moment creates the reality you experience and impacts the realities of others. To really embody this is to take responsibility for who you are in the world while also encouraging you to really accept your power and how powerful you can be from the space of love and truth. Power is not to take control of yourself, life or others, it is to harness everything you have available to you using it to create goodness for yourself and others. It is important to hold the understanding that you have access to, can receive and embody the whole and complete truth of the Creator. With this knowledge you become powerful and open to receive all that is available to you. There is a second important understanding to accept and acknowledge which is that you have a purpose of bringing forth certain aspects, qualities, wisdom and knowingness through your being from the source of the Creator. It is your purpose to align with the whole and complete truth of the Creator and your purpose to express through your being an aspect of the truth of the Creator that is relevant to and aligned with your incarnations. These two purposes are different, they offer you access to the power of the wholeness and completeness of the Creator while allowing you to realise you can focus on delivering a small portion of the truth through your being and into your reality, which will feel like a mammoth expression. It is not for you to express the whole truth, simply what is relevant for your current incarnation. Your soul came to the Earth to remember and experience an aspect, quality or experience with the Creator. You do not even need to know what it is your soul wants to remember and experience. By simply aligning with the whole and complete truth of the Creator you will allow yourself access to the truth that is essential for your existence now. It will flow to you and through you, inspiring your existence on the Earth. Your greatest mission is to align, receive and act on what you receive from the Creator, knowing you have available to you all you need. When you put this mission into action, everything flows with ease and perfection, manifesting fulfilment. Breathe deeply and allow me, Archangel Michael, to work with you to empower your alignment with whole and complete truth of the Creator. ‘Archangel Michael, I invite you to commune with my soul, please support me in connecting with the truth of the Creator that is most important for me to receive now to empower my being and reality, allowing me to exist in and as my purpose on the Earth. I am open to receive now. Breathe deeply and allow me, Archangel Michael, to work with you to support you in receiving the truth most essentials for your embodiment. Take time to breathe in your choosing and promise as well as the energies and light I, Archangel Michael, share with you as I magnify your being.